His pager kept beeping and the third beep was the charm. Dr. Nichopoulos, "Dr. Nick" for short, quickly headed to the nearest phone to find out who was calling. It was Tuesday, August 16, 1977, a day that would be cemented in many minds. The panic that can only enter a voice when something is terribly wrong, met him on the other end of the line. "I think he had a heart attack," Joe Esposito called out to him. 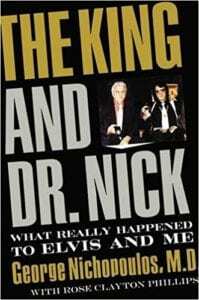 Dr. Nick was Elvis Presley's doctor and something was wrong, very wrong. An ambulance rushed to transport him to Baptist Memorial. It wasn't long before the world knew what happened at Graceland, but would they ever really know what happened? "Stop CPR. He's gone." Dr. Francisco made the announcement that the "cause of death [was] cardiac arrhythmia due to undetermined heartbeat," but that wasn't enough. There had to be more, a hidden reason why the King was gone. That quest would ultimately fuel "a controversy that has never died." Vernon was heartbroken and wanted to know who had killed his son. The frenzy had only begun. The media began to circle like vultures. If there were answers, they would find them. Dr. Nick claimed he was cautious when he prescribed drugs, carefully placing them in small brown envelopes ready to be dispensed by Presley's nurse. An innocuous treatment plan and careful monitoring of a patient was commendable, but some people looked askance. "I was saddened and hurt that Elvis's use of prescription drugs had been kept from me." Dr. Nick exclaimed. Dr. Eric Muirhead doubted that heart disease was the culprit. Someone had to be blamed for this death. The death certificate was signed by Dr. Nick and he thought that would be the end of the questions, but they had only begun for the man who soon became know as a "pill pusher" and the man who killed Elvis Presley. Was there a cover-up? ABCs 20/20 wanted to know about "over five thousand Schedule II narcotics and/or amphetamines" he had prescribed to Elvis Presley. Was Dr. George Nichopoulos being tried in the press? Were these people going to crucify an innocent man to get the scoop or was he really guilty as charged? I was really quite stunned by many of the revelations in this book. Dr. Nick claimed that he "was confident the truth was on [his] side" and he presents a lot of information for and against him in this book, including a detailed toxicology report. There is an extensive list of source data in the back of the book that includes legal documents, court records, articles, interviews, etc. I am not up on anything "Elvis" and I'm sure many of these revelations are not new to people who have followed this case for the past thirty-two years. Without extensive reading I would not be able to fall on one side or the other, but I did keep in mind that Dr. Nick has had many years to formulate his responses to accusations put before him. He did say that "There were ten charges for which I was ultimately found guilty, which all dealt with overprescribing." Guilty or not? This is a well-written and carefully researched book, but the ultimate verdict will have to rest with the individual reader. Quill says: Did the press railroad an innocent man to get the "scoop" or was Dr. Nick guilty as charged?